The DBR laser diode spectrum consists of a single narrow line. The following evaluation of the spectral laser linewidth and line shape were performed by B. Luey from Vescent Photonics. Figures 1 to 4 show beat notes between two 852 nm DBR laser diodes fabricated by Photodigm. There is a weak lock (<10 kHz) to the beat note to keep its center constant, but the lock has bandwidth below the resolution bandwidth of the spectrum analyzer observing the beat notes. The bigger frequency spans give more accurate data for measuring the broadband or Lorentzian portion of the laser noise, while the smaller frequency scans give more accurate data for measuring the FWHM or 3 dB width of the beat note. Based on the data shown below, the Lorentzian portion of the laser noise is approximately 120 kHz, but the Gaussian noise brings the FWHM of the laser linewidth to approximately 600 kHz. Figure 1. 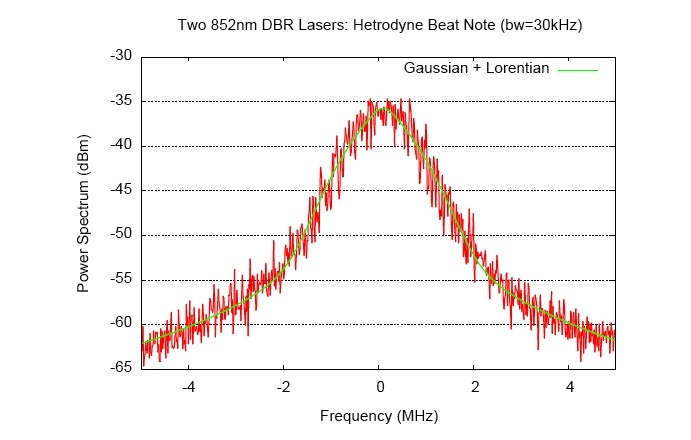 Beat note between two 852 nm DBR lasers with 30 kHz bandwidth. Power normalized Lorentzian fit yields linewidth of 233 kHz, or 116 kHz per laser. Figure 2. 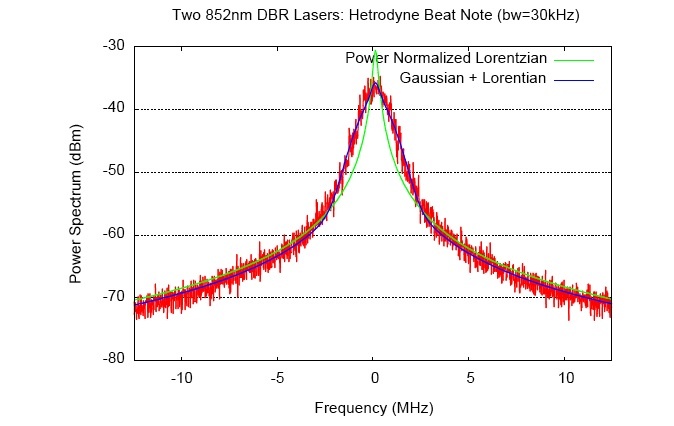 Beat note between two 852 nm DBR lasers with 30 kHz bandwidth. Power normalized Lorentzian fit yields linewidth of 260 kHz, or 130 kHz per laser. The 3 dB width is 850 kHz or 425 kHz per laser. Figure 3. 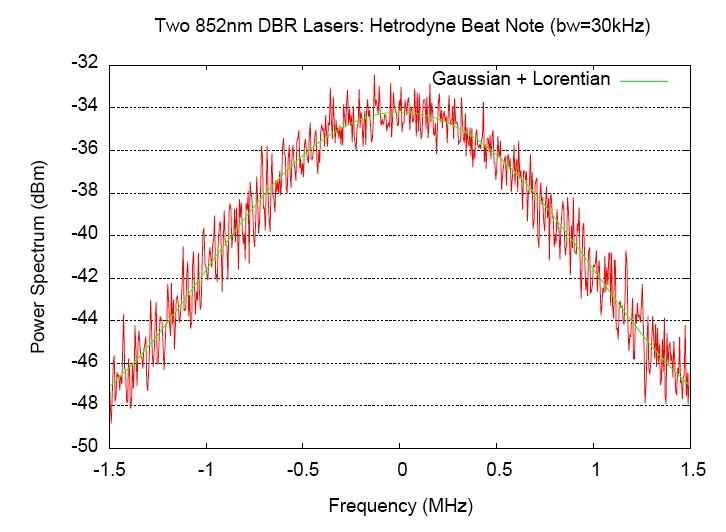 Beat note between two 852 nm DBR lasers with 30 kHz bandwidth. The 3 dB width from the fit is 1.1 MHz or 560 kHz per laser. Figure 4. 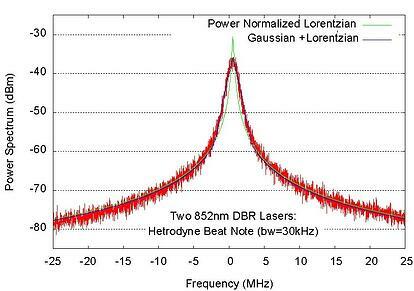 Beat note between two 852 nm DBR lasers with 30 kHz bandwidth. Zoomed in to mesure 3 dB width. FWHM (3 dB width) from the fit is 1.24 MHz or 620 kHz per laser. Vescent has also measured the linewidth of Photodigm 780 nm DBR lasers. Photodigm high power 780 nm DBR lasers exhibited open-loop linewidth FWHM of 250 kHz.